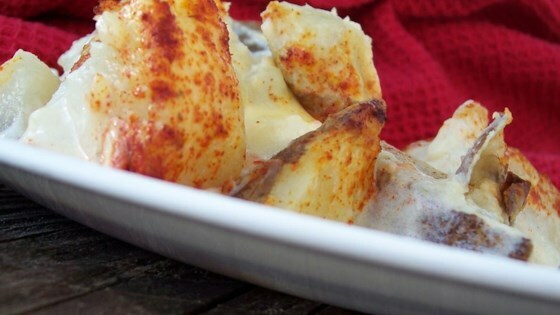 "This is a cheesy, savory potato dish made with Velveeta®, sour cream, and onions. It is a favorite among all who try it." My husband hates sour cream so I was a bit worried about this one, but he loved it. It didn't have a strong sour cream taste and was delicious. Quick and easy. Watch the the cheese/butter in saucepan. Will burn easy even on low setting w/ gas stove. Must stir constantly. Lots of flavor. My 14 yr old son loved it. Quick and easy to make, not a lot of fuss. I had several baked potatoes left over from a previous meal and used them. Very creamy and oh so good. Very good potatoes! I am from Pittsburgh and It brought back very happy memories. Thank you! I made as directed but added some leftover ham. The whole family loved it. The sour cream & onions made them so flavorful. Will make again!